​To provide a new pair of shoes to as many children possible in the Dominican Republic. Eileen Berger and her family occasionally go on summer vacation to the Dominican Republic with accommodations in a hotel in the tourist area. In 2012 They decided to visit her moms uncle in the country. While visiting San Juan De La Maguana they came across poor areas where the families of limited resources lived. In the Dominican Republic around 41 percent of the population lives below the poverty line. Nearly 75 percent of the population lives in an urban context. Challenges there include lack of access to basic services like clean water, shelter, medical care, education, sanitation, public safety, and electricity. Eileen was really sad when she seen how poor the people appeared, especially the barefooted children. One evening she played with some boys and girls from the village. She was so happy to be able to give them her clothing, accessories and foot wear. Eileen's mom Nazaret thought it would be a good idea to sing songs and polish the nails of the girls. It was their first time getting their nails done. Watching them playing with their polished nails made Nazaret feel great. This touched Nazaret deeply because once upon a time she was that little girl. Nazaret Medina, born in the Dominican Republic, lived there until adolescence, but although she had shoes, she could easily relate to the situation because she also experienced a similar form of life that grows in the Dominican Republic. Eileen and her family left The Dominican Republic feeling so sad and this made Nazaret feel so helpless. Eileen's words played over and over in Nazaret's head "Mommy they have no shoes and they are walking on the hot ground" Eileen insisted for her mom to help the children by buying them shoes. Nazaret made a promise to Eileen. She explained to her, she didn't have the money to help them all but one day they would help as many children as possible. Nazaret hoped that one day she could return to the Dominican Republic to fulfill their mission. In fact, their dream came true. Eileen's persistence and Nazaret's love for her country all aided in the creation of Happy Feet Foundation", In 2016 they returned to the Dominican Republic and donated clothes and shoes to as many as they could. 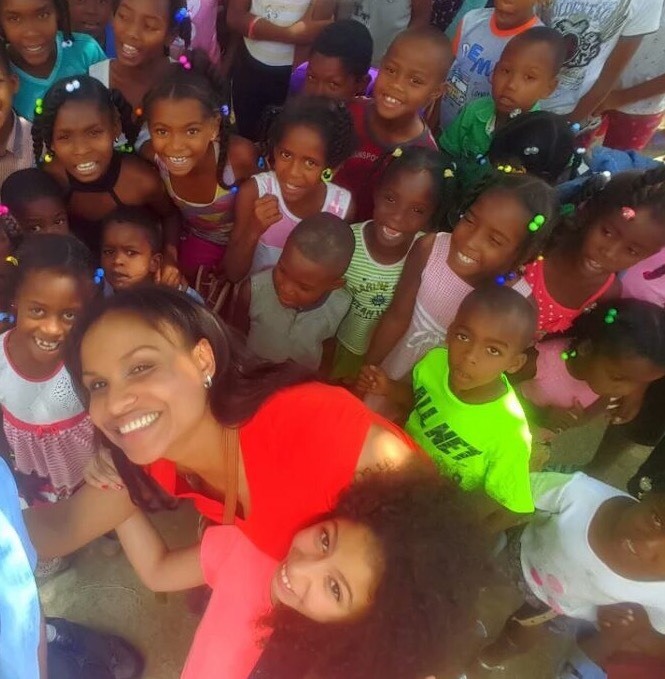 Happy Feet Foundation was created with our best intentions to help the children of the Dominican Republic. Our mission is to provide shoes to as many child possible. "Eileen Berger has a heart of gold". I would like to thank everyone for helping her achieve this service. Thank you for keeping the children of the Dominican Republic in your prayers. Eileen decided to name this cause "Happy Feet Foundation" because she believes comfort brings happiness and every child deserves to feel happy.